Grand Elder: Last Day of School. Today was the last day of school for Seniors. I have to admit it was fun but I did cry because I will miss a lot of awesome people like my amazing Literature teacher. 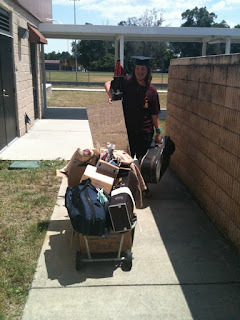 After four years part of that school felt like home especially the band instrument storage room in which I held many possessions: my Director's chair, didgeridoo, box of abandoned shoes, lots of sheet music, trombone, decorations from prom (I didn't go but I could not let them throw away some of that stuff. ), and a lot of other things. I will really miss that place but I can now go on to better or worse things. This is mine and my friend Joe's stuff from our locker's.